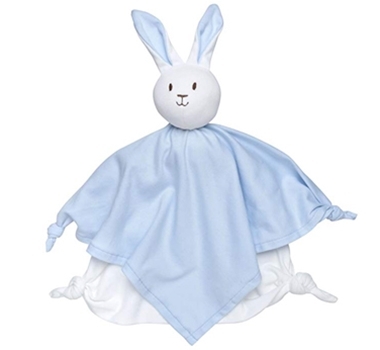 Blue Bunny Blanket will become your baby's favorite toy! Knotted hands & feet make it easy for Baby's little hands to hold and teethe. Under the Nile offers an alternative to conventional cotton apparel for infants and children. This blue cotton baby blanket is made from 100% handpicked organic cotton, without the use of pesticides or chemicals throughout the entire production process. Grown exclusively in Egypt, the products reflect the extremely soft and durable features that Egyptian cotton is known for. Under the Nile's dyeing process uses metal-free or vegetable dyes. Accessories on this blue bunny blanket, such as buttons and zippers, are made from organically friendly elements such as wood, shell or nickel-free metals.